The word Pindapatha is a combination of two words “Pinda” and “Patha”. “Pinda” means food and “Patha” means bowl. Therefore, Pindapatha means literally “placing of food in a bowl”. There is evidence that this custom had been followed by Shramanas even in pre-Buddhist times. It can be presumed that this was introduced by the Shramana Movement and definitely not by the Buddha. The Brahimin was a carnal layman. He had his own livelihood, but he accepted what was offered by pious people. Shramana was a totally different breed from Brahmins. He was a person who rejected the lay life totally. The Buddha belonged to the Shraman Movement and He followed the Pindapatha custom. However, He developed the custom as a more disciplined movement for Bhikkhus. The word “Bhikkhu” literally means “one who lives by Pindapatha” thus implying the specific significance for Pindapatha in Buddhism. This possibly could be the reason why the Buddha identified His disciples as “Bhikkhus”. According to Buddhism, there is no harm in accepting alms people bring to the temple or they provide in their houses. But what is considered important is living by Pindapatha. The custom helps to develop Bhikkhu qualities such as contentment and humility. It also provides opportunities for the rich and the poor to gather merit. The Pindapatha is not just begging. It's a totally different custom. We can understand it properly only when we refer to the teachings of the Buddha on Pindapatha. They are found in Suttas and Vinaya Pitakas. The Bhikkhu who goes on Pindapatha wears single lined and double lined robes together. The Patha (the bowl) is special equipment Bhikkhus use for having food. It is carried in the left hand and is kept on his belly above the navel and is covered with the robe. He is supposed to use his right hand to keep the robe properly when walking. Then he leaves for village with gentle walk looking forward about a yoke-pole length distance. A Bhikkhu does not differentiate between the rich and the poor, the high and the low castes and goes to all the households when going on Pindapatha. He should not consider the taste of the food or who offers which food, but ought to accept whatever is offered by pious people. Being choosy on food or those who give food has been rejected by the Buddha as they are not suitable for Bhikkhus. The Bhikkhu should always go to the front door. He should stand a respectable distance from the house. He should not enter or leave quickly. He observes to fathom whether or not the inmates are willing to offer food and if he feels that they are willing to offer he remains there and if he feels that they are reluctant to offer him alms he leaves the premises. 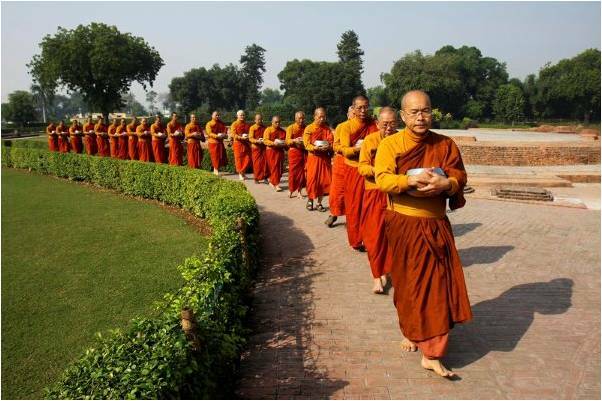 When receiving alms the Bhikku extends his Patha by both his hands towards the person offering alms. He is not supposed to look at the face of the devotee, to smile or talk with him. He is also not supposed to ask for any particular food from the devotee. If the devotee seems to be going to offer curries in addition to rice the Bhikkhu should remains there. The Bhikkhu is permitted to accept Pindapatha only up to half of the Patha and stop the Pindapatha journey once the half way mark is reached. Greed or having too much food is not suitable for him. After receiving enough food, the Bhikkhu starts his journey back to he temple. If the feels hungry and there is not enough time to get back to the temple he is permitted to have his food under a tree or in a rock cave where water is available. He should avoid partaking food in crowded places or on the streets. Water should be filtered before drinking. If a filtering cloth is not available, water should be filtered with a corner of robe. If there are more than one Bhikkhu in temple, they all can go on Pindapatha together. They should go in a line one behind the other keeping a distance of six to seven feet according to seniority. They need to go on the same road. He who receives enough food should go back to the temple. Then he can make arrangements to have alms. If there is food remaining, it can be given to beggars or animals. Any remaining food should be kept on the ground where there is no grass. For breakfast Bhikkhus should go on Pindapatha sometime after the sunrise. For lunch they should go on Pindapatha and finish having food before mid-day. Having food in the afternoon is considered as Vikalabhojana (untimely meal). During the Buddha's time Pindapatha was done once a day. Bhikkhus are not expected to go on Pindapatha to places where there are prostitutes and liquor bars. If any Bhikkhu enters such a palace unknowingly, he should leave the place as soon as possible. The great renunciation of Prince Siddhartha took place on an Esala Full Moon Day. That was the day he went on Pindapatha for the first time in his life. When he was ready to have the Pindaptha alms he was nauseated by the sight of the food which was an unpleasant mixture far from appetising. There was a poor old woman in Sawatti city and she used to serve a spoonful of rice to Ven. Kumara Kassapa Thera every day. He resembled the Buddha. Once the Buddha arrived the woman thought that it was Ven. Kumara Kassapa Thera and served a spoonful of rice. Later Ven. Kumara Kassapa Thera arrived. Then the woman realised what happened and followed the Buddha asking for the spoonful of rice back. The Buddha allowed her to take it back. The woman served in to Ven. Kumara Kassapa Thera. He was shocked by the incident and after that he never lived there until his passing away. The Englishman Robert Knox had made a description in his book ‘A historical relation of the island Ceylon'. “There is a marvellous kind of beggars in Ceylon. They are bald headed and wear the same kind of dress. They go on begging food from hosue to house with a round bowl in their hands. The most marvellous thing is the people give them most precious food they have and lastly worship also”. The Pindapatha custom still prevalent in Buddhist countries, particularly in Sri Lanka.